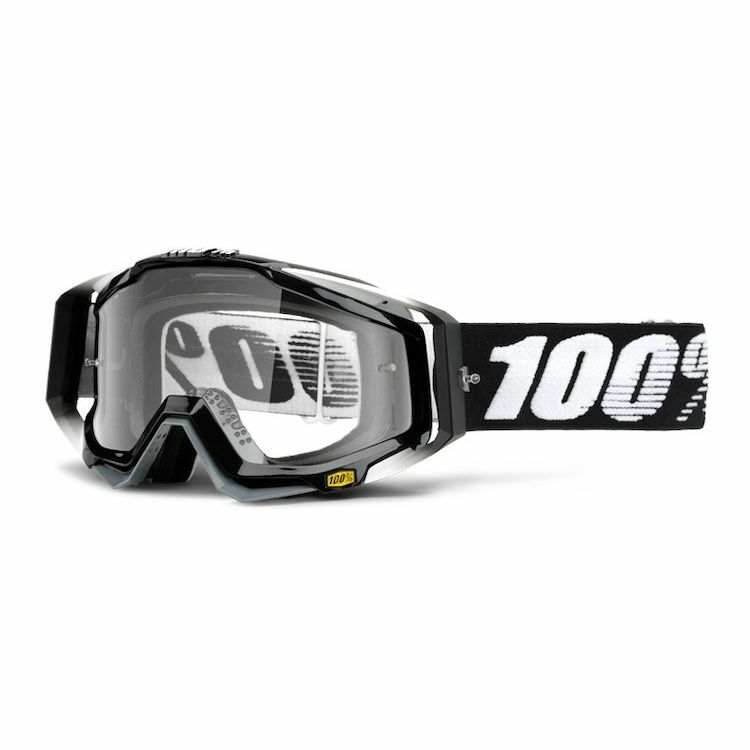 The premier 100% line of goggles represents their commitment to create an enhanced user experience, by providing riders with a higher level of functionality and accurate vision. The Racecraft is a synthesis of precision engineering and minimal design, which produces a goggle that performs and feels as great as it looks. it has been a huge pain ordering goggles that fit over my glasses because i have larger frame glasses, plus i was trying to buy goggles on line, finally went to the store and tried these on and have been a fan ever since. They look good and function well, my only issue is finding a helmet I can wear the nose piece with. Oh well. I promise everyone that these are EXCELLENT!!! dont hesitate just BUY!!! Not much to say, really. These are solid, quality goggles. I got the yellow mirror finish, and it looks good. Not too much tint, but just enough to cut the glare. The added nose protector is nice, and the lens is not flimsy. Good-quality elastic, and easily adjustable. Oh, and the free stack of tear-offs and extra clear lens is a great bonus. Would buy again! I bought the blue/white ones with blue ion lens. The lens is nice because it works in both sunny and cloudy conditions. The view is wide, but maybe too big. The goggles let air in between my face and foam into my eyes. I don't know if it's that my face isn't big enough or my dual sport helmet doesn't let them fit all the way in, but they don't really keep wind out of my eyes while riding my dual sport on the road. It's bearable, but annoying and I wonder how they'll fair offroading keeping the dust out. Great looking and cool goggles though. I want to love these goggles, but instead I only just really like them. I wear a Bell moto 9 carbon flex helmet, and these goggle push just ever so slightly on my nose, making it just slightly annoying. These are really expensive as far as goggles go, so that makes it a little harder to tolerate a less than perfect fit. That aside (I get used to it almost immediately - its just when I first put them on that it bothers me) they are pretty awesome goggles. The clarity of the lens, the seal with my face, the looks and quality are all first rate. Just ride with them today an I love them. The only downside is they pintch my nose so I turn into a mouth breather. great google, only wish I could pick any lens color with any color goggle frame. The noise becomes a burden on the highway after a long day riding but not so bad to bother packing a face shield. They fit into an AGV AX-8 DS Evo eye port very well and field of vision is good. They are well made. Best seller and a color scheme to match helmet. Trail riding on my new WR250R. Came with both a clear and tinted lens and seems to be a good product. I have several pairs of 100% goggles. I like how the lenses interchange on the race craft and accuri goggles. They fit nice and look good. excellent comfort, visibility and wear. Fits the helmet I purchased. Because I see that they come with a lot of good things and I've heard great things about the goggles. Bought a pair for my wife and now I can't stand my nose pinching Thors! So comfortable with the triple foam, and no fog issues... BUY THEM NOW! Known product name and high ratings. Great brand name and love the generous view size. Combo pack is awesome! Clear lens included with tear-off's. Fit comfortably and stylish. wide field of vision, fit, and comes with both tinted and clear lenses. Is the 100% Racecraft goggle compatible with an Arai XD4 helmet? BEST ANSWER: Never owned an ARAI but seriously do not see why not! Does the lens block UV light? BEST ANSWER: Hey William, I don't see anything that says these lenses are UV protected. If you plan to ride in super bring conditions I would recommend any of the mirrored finished lenses since they would offer the maximum reduction in glare. Thats what I have done! Blue mirrored lens and I live in the sunny Med. on the island of Crete in Greece! They work fantastic! BEST ANSWER: Here how Scott explains it which is spot on. I prefer a yellow lense while riding in the woods. Amp Blue: Visual clarity in most light conditions. Yellow: Increases depth of field and visual clarity in overcast conditions with low or flat light. Light transmission: 71%. Filter category: 1. Clear Anti-fog: Maximum visible light transmission in all weather conditions, late afternoon and night riding. Anti-fog coating. Light transmission: 90%. Filter category: 0. Clear Anti-stick: Maximum visible light transmission, all weather conditions. Prevents Works Roll-Off film from sticking to lens. For use in muddy / wet conditions. Light transmission: 90%. Filter category: 0. Grey: Neutral tint to reduce eye strain in strongly alternating sunny / shadowed conditions. Light transmission: 49%. Filter category: 1. Blue Chrome: Great option for sunny to medium light days; the blue chrome coating reduces glare on this exceptionally contrasting lens. Light transmission: 21%. Filter category: 2. Silver Chrome: Great option for sunny to medium light days; the silver chrome coating reduces glare on this exceptionally contrasting lens. Light transmission: 27%. Filter category: 2. The colored lenses are like sunglasses - they're great for bright sunlight riding. I have the Gold mirror and the lenses are gradient from dark up top to lighter down low - perfect for riding in the middle of the day. They also come with clear lenses for dark or cloudy riding. These are 100%(no pun intended) hands down the best I've ever used. Do they have a dual pane lens? BEST ANSWER: Thats what I wanted at first but after using these I do not care that they are not dual pane lense! They are EXCELLENT!!! Do they all come with a nose guard? Or just some of the colors? How is this for sportster riders? i"m currently using Builtwell Gringo. does it fit with my helmet? BEST ANSWER: I'd love to help. I'm more of a Downhill rider and I'm not sure how much opening you have on your helmet . But for the most part I thinking you could fit it. If you post the size of your opening on the helmet I could me sure my goggles and see if it would fit! BEST ANSWER: Yes. They work with my XD4. Cannot close visor with goggles on though.